Chris Brogan is a freak. And a very successful one too. Author of numerous bestselling books on social media and influencer marketing, including “The Impact Equation“, Chris has consulted with huge companies like Disney, Microsoft, Coke and Google, and is the publisher of Owner Magazine. He has also sold multi-million dollar companies, and amassed huge followings on social networks like Facebook, Twitter and Google Plus. 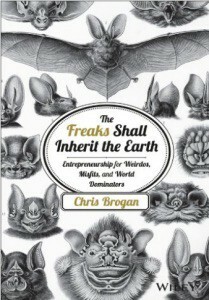 His latest book “The Freaks Shall Inherit the Earth: Entrepreneurship for Weirdos, Misfits, and World Dominators” touts itself to be a “real-world business playbook” for entrepreneurs (or wannabe entrepreneurs) who have a problem fitting into the strictures of society. It teaches you how to think differently to overcome your fears, create a vision for your exciting new venture, and start making your entrepreneurial dreams come true. In other words, “The Freaks Shall Inherit the Earth” was written specifically for weirdos and misfits. Like me. And boy was I charged up after reading it! So what lessons are contained in this slim business book? There are 12 altogether, and I shall summarize them here. Be proud of your freakishness as an entrepreneur or an intrapreneur. Make art and embed it in your craft, regardless of the business you are in. Learn to overcome fear. Build discipline into your life by changing your programme, talking yourself into it, starting and keeping good habits, “eating” lots of goodness (uplifting content), carving away bad habits (like watching TV), and working more than you celebrate. 2. Define Your Own Success. Establish the ingredients which make up your success. Money? Time? Fame? Achievement? Progress? Health? Serenity? Understand that failure is definitely an option, and use it as an opportunity to learn. Work on your weaknesses and commit to learning one or two new skills every two to three months. Ensure that you put aside time to learn about marketing, sales, finance, and legal aspects of running a business. Put it in your schedule so that you will not forget. Master time, be curious, and explore so much that you make Dora look like a homebody. 4. Work from a Framework Daily. Put in place positive daily habits and schedule it so that whatever needs doing gets done. Work out a list of things that needs doing. Through this, you will build discipline and kill time wasters. Regardless of whether you are an employee-preneur, employee or solopreneur, there is always an end objective for you. Look towards where you are heading towards. Use it to decide on what you should do right now and where you are heading to next. Each destination will have a unique requirement. The important thing is that if you do not have a road map, you are more likely to get mired in the woods and lose your direction. 6. Fall in Love with Not Knowing. Learn to be comfortable with what’s unknown. Overcome your fear of failure and have a battle plan so that you can better prepare for such occurrences. What exactly am I trying to figure out? Can I break this project down and list the smaller details? Can I accelerate my learning? Can I buy my way past some of this (in the short term)? What’s a task list that would help me work on this? Can I find a similar model? What can a practice plan look like? How will I know I’m better? 7. Welcome Obstacles and Challenges. Set a new challenge for yourself every month, and use it to hone your obstacle clearing muscles. This can be a list of the various challenges which you may normally avoid or run away from. It can be an interesting list of stuff like “Ask my customer for referrals.” or “Call the officer from the regulatory department”. The more challenges you face daily, the stronger and more resilient you will feel about your business, and more importantly, your life. 8. Create Systems That Work for You. Like the step on creating frameworks, you need to build systems that help you to work better. This would help you to automate certain tasks so that you do not have the burden of remembering to do them each day. Daily actions: The detailed checklist of stuff that needs to be done each day. Reminders: The important strategic goals which you’ve set out to achieve, for the short, medium and long-term. Affirmations: Positive words that encourage you, edify you, and inspire you. 9. Build Your Media Empire. In the age of social media and digital content, it pays to have a media project for your work. Before building your media channels, do consider variables like cost, time to create, personality (are you good on video? ), and searchability (think Search Engine Optimization and Social Media Optimization). Marketplace: Create a marketplace to reach out to like-minded folks in your community in specific areas of interest. 10. Connect with Your Fellow Freaks. Make a pledge to connect with at least three to five new people a day if possible. The more folks you can find to serve, the better your chances of success. Beyond helping others and serving them, you may also wish to connect two people who might benefit from knowing each other. Do everything to keep your monchu (ie family in Okinawa) alive and well. As an entrepreneur, it is important to instill the concept of ownership in everything that you do. The more you are able to take ownership of your circumstances, the better. Start with owning your words. Keep a list of negative and defeatist things not to say, and make a new list of empowering words. Make positive choices in your life too, so that you can keep growing. 12. Be Ready for Bad Times. Last, but certainly not least, be ready when the sh*t hits the fan. There will be road bumps, and there will be people whom you disappoint. A Clarion Call for Freaks. With the encouraging call for freaks, weirdos and oddballs to “inherit the Earth”, The Freaks Shall Inherit the Earth is a joy to read. The most important message? Start doing your life’s work now. In other words, don’t just read the book and shelf it. In Chris’ world, it is better to start somewhere now than to wait around for the chance of doing something only when everything is in order. Which will probably never happen. Let me end by quoting a paragraph from the book.